See also: 1999, 2000, 2001, 2003, 2004, 2005 and 2006. Also in Gary Nicholson chat show, 1430h, 29 December. See also Braemar Daily Times, 21 December, 23 December (with photograph). Sailing Malaga, Spain - Casablanca, Morocco - Santa Cruz, Tenerife - St John's, Antigua - Portsmouth, Dominica - Roseau, Dominica - Castries, St Lucia - Bridgetown, Barbados; 19 December-3 January. BJF, 2002, Interviewed by Peter Johnson on ethics in science and cloning, Good Morning Wales, BBC Wales, 0750-0755h, 5 January. BJF, 2002, Interviewed on Nature report of risks of contracting vCJD from sheep, Breakfast Programme, BBC Cambridgeshire, 0715-1720h, 10 January. [Parry, Bill], 2002, Brian J Ford on Round Britain Quiz, Biobits: 5, January. 14 February, 1100h, International Lounge, Amateurs who gave us the Scientific Age. 17 February, 1100h, International Lounge, Has Food a Future? 18 February, 1100h, International Lounge, Where the Caribbean came from. 20 February, 1100h, International Lounge, What future for Global Warming? Sailing: Bridgetown, Barbados - Castries, St Lucia - Pointe-à-Pitre, Guadeloupe - St John's, Antigua - Gustavia, St Bart's - Road Town, Tortola - Ocho Rios, Jamaica - George Town, Grand Cayman - Kralendijk, Bonaire - St George's, Grenada - Bridgetown, Barbados, 8 - 22 February. BJF, 2002, [in] Smallpox documentary, producer James Stewart, Wales this Week, HTV, 22 February. BJF, 2002, Trouble on the Hoof, Disease Outbreaks in Europe, [chapter on foot and mouth disease in] Encyclopaedia Britannica Yearbook, Chicago, in press. BJF, 2002, interviewed by Ronnie Barbour on QX3 microscope, Drive Time programme BBC Radio Cambridgeshire, 0750-0755h, 20 March. BJF, 2002, interviewed on children mutants using their thumbs, Good Morning Wales, BBC Radio Wales, 0855-0859h, 25 March. BJF, 2002, interviewed on current projects and April Fool joke, Kevin Saddington Show, BBC Radio Cambridge, 1005-1040h,1 April. Mack, Tom, 2002, City boffin to help kids (with photograph), Peterborough Evening Telegraph: 29, 1 April. Report, 2002, Behind the news (with photograph), Peterborough Evening Telegraph: 16, 2 April. BJF, 2002, reviews Visualisations, the Nature Book of Art and Science by Martin Kemp, Quarterly Review of Biology 77 (3): 314. Gordon., Rachel, 2002, interview with BJF on education and child behaviour, Peterborough Evening Telegraph: 9, 9 April. 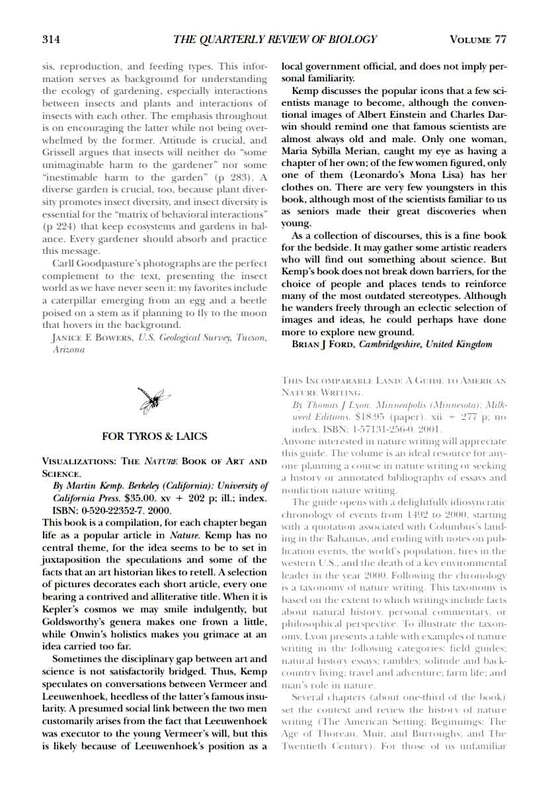 BJF, 2002, reviews S. M. Walters and E. A. Stow's Darwin's Mentor [in] Biologist, 49 (2): 87. BJF, 2002, A load of new balls (report on bioballs technology), Laboratory News, May. BJF, 2002, chairman's address (and cited in) D. J. Stokes lecture on ESEM, Cambridge Society for the Application of Research, Churchill College, 1930-2100h, 29 May. Report, 2002, paragraph on compiling QX3 manual, Biobits: 7, May. BJF, 2002, Japanese translation of Sensitive Souls 1999, ISBN unknown, 000pp, Tokyo, [in press]. Sailing Barcelona, Spain - Eivissa, Ibiza - Malaga, Spain - Gibraltar - Lisbon, Portugal - Harwich; 15-22 May. Jones, Ben, 2002, Town gives early support to centre, Whittlesey Cambs Times: 7, 17 May. Carlsson, Karen, 2002, The cross-disciplinary soap bubble (report on Brian J Ford visiting Uppsala University, with colour photograph), Horizon Uppsala: 11, May. BJF, 2002, Spain on a Shoestring, Living Spain magazine, June. Corliss, John O., 2002, citations of Brian J Ford Single Lens and Leeuwenhoek Legacy [in] A Salute to Antony van Leeuwenhoek of Delft, Protist, 153: 177-190, June. BJF, 2002, Nel piatto, salute, sicurezza e futuro del cibo, [Italian translation of Future of Food], ISBN 88-86412-83-5, 128pp, Milan: Edizioni Ambiente. BJF, 2002, Interview on food labelling and safety, 1200-1230h, BBC Wales, 11 July. BJF, 2002, Article on academic language, The Author, July. BJF, 2002, Interview by Alan Little on academic language (based on article for The Author, q.v. ), 0855-0900h, BBC Today programme, 16 July. Shimizu, Thomas S., 2002, reproduces BJF micrographs [in] Spatial Organisation of Cell Signalling Pathways, PhD Thesis: 18-19, Cambridge University, July. Sailing Southampton, England - Spain, Vigo -Madeira - La Palma - Tenerife - Lanzarote - Lisbon, Portugal - Southampton, 21 July - 02 August. Report, 2002, Brian J Ford's experimental manual, Update, New York Academy of Sciences: 12, August/September. Allen, Chris, 2002, Village hall will be powered by weather (with colour photograph), Peterborough Evening Telegraph, 27 September. Sailing Southampton, England - Lisbon, Portugal - Cartegena, Spain - Barcelona, Spain - Sorrento, Italy - Dubrovnik, Croatia - Venice, Italy - Hvar, Croatia - Palermo, Sicily - Mahon, Menorca - Vigo, Spain - Southampton, 27 September-18 October. Report, 2002, Scientist to appear on TV show (with photograph), Whittlesey Cambs Times: 3, 8 November. Report, 2002, Cruise news (with photograph), Biobits: 6, November. BJF, 2002, Defnuddio'r Microsgop Digidol, Welsh translation by Huw Roberts, ISBN 0-9543595-1-8, 32pp, Cambridge: Rothay House, November. Cruise Director's chat show with Brian J Ford, Coral Lounge, 3 December, 1600h. See also: Brian J Ford, Guest Lecturer, Braemar Daily Times: 1, 28 November 2002. Sailing Bridgetown, Barbados - Scarborough, Tobago - Macapa, Brazil - Santarem, Amazon - Alter do Chao, Amazon - Manaus, Amazon - Parantins, Amazon - Macapa, Brazil - Devil's Island, French Guiana - Bridgetown, Barbados, 21 November - 6 December. BJF, 2002, Japanese translation of Sensitive Souls, ISBN unknown, 000pp, Tokyo, [in press]. Daerr-Monell, 2002, includes contribution by Brian J Ford [in] Tribute to Walter C McCrone, The Microscope, 50 (2/3): 70. Return to previous year 2001, or next year 2003.